Luke Keary and Daly Cherry-Evans got first crack at being Cooper Cronk and Johnathan Thurston’s replacements. 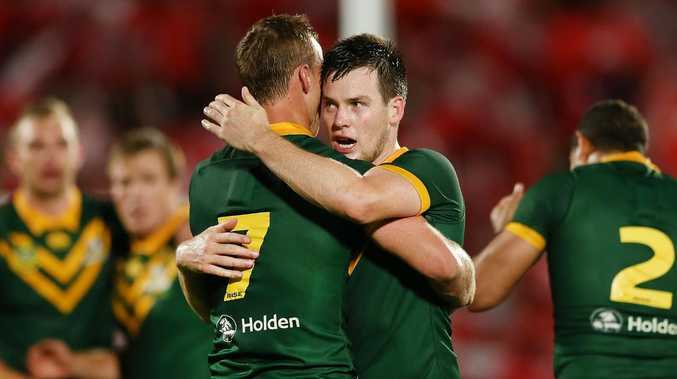 KANGAROOS five-eighth Luke Keary concedes his two-game cameo might not be enough to hold his Test spot. A week after concussion ended his international debut 17 minutes into the loss to the Kiwis, Keary recovered to help Australia beat Tonga in Auckland on Saturday. "I was a bit dusty the first couple of days, but I felt alright," Keary said. Kangaroos selection capped off a memorable year for the 26-year-old, who was also the Clive Churchill Medal winner in the Sydney Roosters' grand final win over Melbourne. Keary said the sellout Mt Smart Stadium crowd, which was almost exclusively supporting Tonga, though noisy and passionate, was less hostile than he anticipated. "It's almost like a festival. We were saying in there, the ground announcer was singing songs over the loudspeaker during the game," Keary said. "You couldn't hear anyone, which is what you want. We've been dying for stadiums like this to get packed out." The Roosters playmaker faces a tough challenge to keep his green-and-gold jumper, having been drafted in late to replace Cameron Munster. North Queensland star Michael Morgan was also unavailable due to injury. "I only played a couple of Tests here. It depends on injuries, form, what's happening at the time," Keary said. "I'm happy to get it this year, and then you've just got to do your best and hope you're in a position to get in that jersey when it comes around. It's hard to say. "Those boys have proven themselves too, at rep level. They'll be sticking their hands up next year for sure." Australia's next Test is likely to be after the next NRL season.